Finstall cyclist Jess Varnish was one of the local stars honoured at Bromsgrove District Council’s Sports Awards. Jess, aged 18, who hopes to compete at the 2012 Olympics, picked up Junior Female Sports Personality of the Year, while the Year 8 rugby squad from Alvechurch Middle School won the School Sports Award. Bromsgrove Golf Centre was declared Club of the Year. The second annual Sports Awards were held at the Spadesbourne Suite at Bromsgrove’s Council House, and highlighted the outstanding contributions of those involved in sports locally, including coaches and volunteers. The evening featured a speech by “Blind Dave” Heeley, the first blind person to complete seven marathons in seven days on seven continents. The winners in all 15 categories were shortlisted for the County Sports Awards, being held at Worcester Warriors Rugby Club on March 4. The Club of the Year award marked a very successful month for Bromsgrove Golf Centre, which recently became the first golf centre in Worcestershire and Herefordshire to gain the “High Achiever” accolade in achieving the new GolfMark Award. Awarded by the English Golf Union and English Women’s Golf Association, the GolfMark recognises commitment to junior and beginners’ golf. The High Achiever status recognises the centre’s greater efforts to encourage and develop its young members. 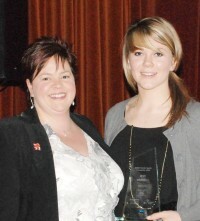 Pictured: Jess Varnish (right) with Sarah Richards of the North Worcestershire School Sport Partnership.